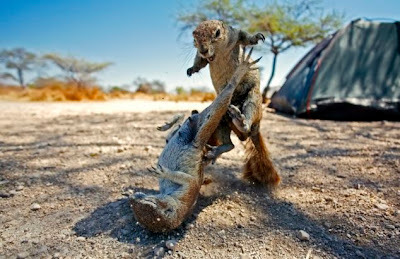 These incredible pictures of squirrels locked in battle on an African campsite reveal fur as well as punches flying. 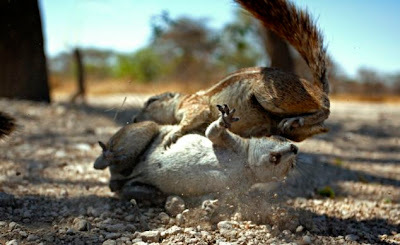 This furious pair of Cape Ground Squirrels were snapped taking part in a ferocious squabble in Etosha, Namibia. The images are so vivid that they almost appear to be staged. 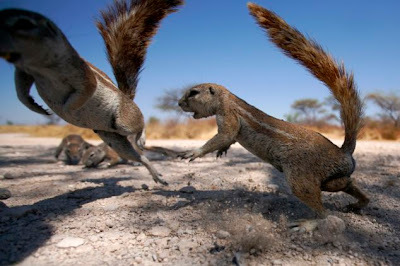 In scenes reminiscent of the freeze-frame Kung Fu moves performed by Keanu Reeves and Laurence Fishburne in The Matrix, the rodents are captured in a series of battle poses. The squirrels seem almost elegant as they whirl around in the dust, seemingly unaware of their audience. 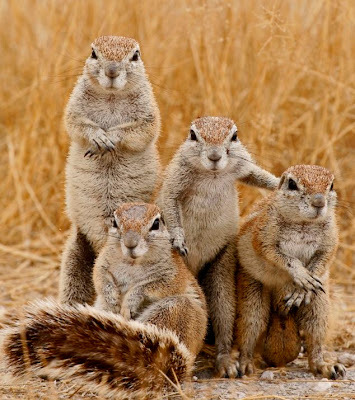 The Cape Ground Squirrel is found in the drier parts of Africa and lives in colonies of up to 30. They are poor climbers so tend to live in interconnecting burrows, which they sometimes share with mongooses. The rodent uses its bushy tail to shield it from the sun and pumps it up and down as an alarm signal to other members of the pack.